Seers are mystical soothsayers with supernatural powers who can communicate with the gods and answer questions about he future and ones fate in life. 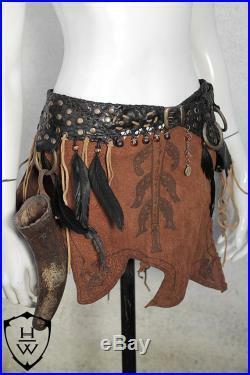 This leather skirt tries to capture that essence and explore the mysticism around it. 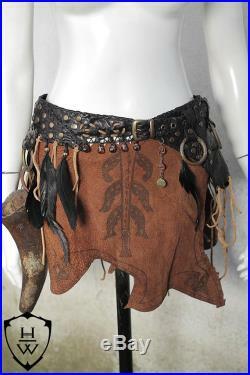 The skirt is made of two independent parts in leather, a black belt and a brown skirt underneath. They can be worn together or separately. 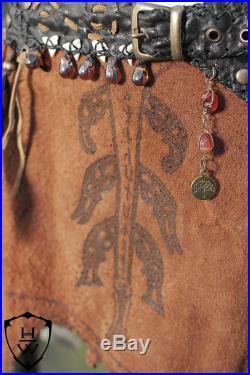 The black belt has intricate designs with spiral motifs, on the left you can find a brass ornament and some aged copper o-rings from where you can hang things (like the example horn on the pictures). 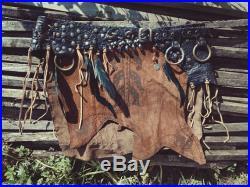 From the hem hangs straps of brown leather. The front is adorned with shark teeth, black feathers, handmade glass teardrop beads and a small gemstone chain from where it hangs a tree of life. 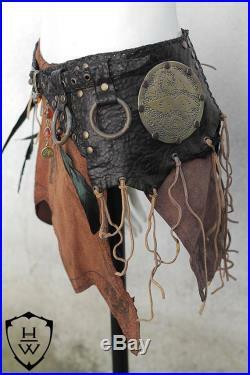 It fastens at the front with a buckle. 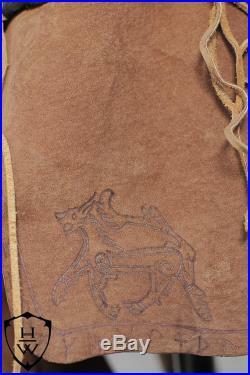 The bottom brown leather skirt has two different shades of brown and it has several engraved drawings from different archaeological findings fro gotland, valsgärde and skne in sweden. 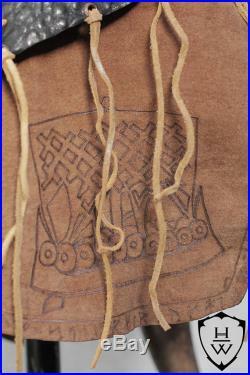 It fastens on the side with strings through eyelets. 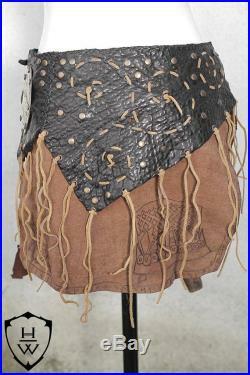 Measurements of the beltclosed at the smallest measure: 84 cm (33")closed and the bigger measure: 94 cm (37")measurements of the brown skirttop: free size, adjust with strings through eyelets. Length: 34 cm (13.5)note: horn not included. Just for an example of how you can use the rings. If you have doubts if it fits you or any other question related with this item just contact meto see more works i make please visit me on house wynford facebook (link above on the shop)we've made every effort to ensure the colors on screen are as close as possible to the actual product colors. Unfortunately, we cannot guarantee an exact color match. Photographs colors will vary depending on your screen settings and resolution. 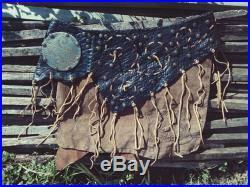 Keep in mind, the items made with leather could have some color variation due to the handmade dyed.